Our Foundry mission starts with creating a safe environment for participating students to learn and experiment with the casting process, while embracing the communal aspect of working in a team. In witnessing the effort that goes into producing a casting project from concept through completion, one can’t help but to see the importance of working together as a collective group to create work that will last the ages. Throughout the year we host opportunities to observe demo pours, partake in workshops, and become involved with our community outreach. SAW also hosts its annual Intercollegiate Iron Conference in September, that is also open to the public. This is our foundry’s largest benefit event. The SAW Foundry visits other schools and pours around the country during the year to help other programs and be a presence of the community at large. Our foundry is an arts-education and training facility where professional artists and students are encouraged to engage in all stages of the casting process, we invite you to become a part of our practice. Participants in the foundry program have access to our 3,100 square foot mold making studio, a metal shop for finishing and the opportunity to participate with pours. We are using a none caustic water soluble resin, but welcome all molds to be poured. Individual work stations are available to rent at the rate of $25 a day. Fee includes basic use of studio equipment and consumables for mold making. All of our pours are open to the public and are a great catalyst for introducing the process to future students. All of our iron pours also give the chance for the public to participate with scratch block molds that are available for purchase on site with instruction. Are you looking to get rid of that old cast iron radiator, sink or rusty tub? SAW is always looking for iron donations to melt back down and turn into one of a kind works of art. Please contact us and we’d be happy to reclaim and recycle your unwanted iron. We are always interested in growing our contact list for metal casters in the area. Let us know who you are and check out our pour dates on our event calendar and get involved! 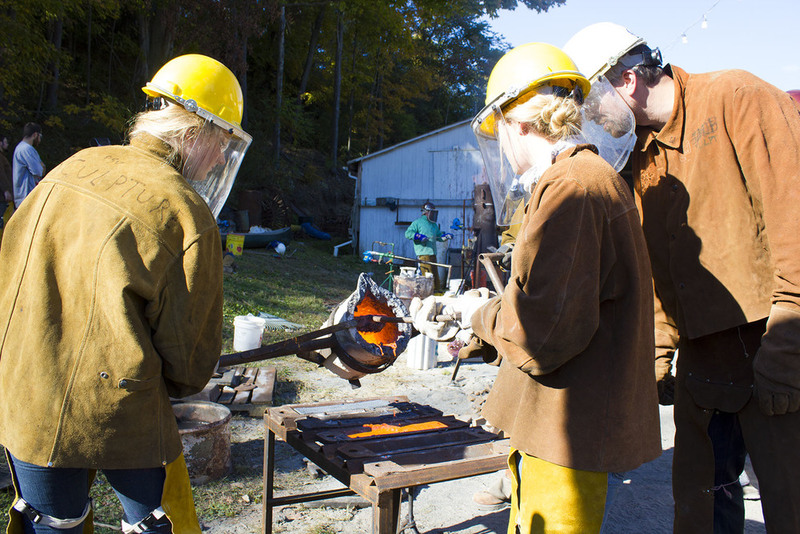 While students are encouraged to participate, walk ups are welcomed with prior metal casting experience. Contact our office today to book a private workshop for yourself, event, or business function. The casting method lends itself to a group atmosphere and SAW serves as a great backdrop to enjoy this creative process for any event. Come and check out some of the product we make here on site by students and artists and help support our programming with your purchase!